Hello, I’m Dr. Martin Schedlbauer and I’m a senior trainer and consultant with Corporate Education Group. With any project, it is challenging to build a solution that fully incorporates the wishes of each stakeholder when working with limited resources, time and money. As a business analyst, you are responsible for determining the most pressing requirements. By using requirements prioritization — the process of managing the relative importance and urgency of different requirements to cope with the limited resources of projects — you can ensure that the most critical requirements are addressed before time and budget invariably run out. Not all requirements deliver the same value to stakeholders. That is why it’s so important to identify the requirements that do deliver value. You should start by prioritizing the business requirements or objectives of the project. Once that’s done, you are able to determine which stakeholder requirements are most urgent. Only the stakeholder requirements that support a business requirement should be in scope. The project team should then address the requirements in order of urgency. This will dictate the order of implementation and ensure that the product is valuable, even if some requirements have to be left out due to time or money constraints. When ranking the requirements, don’t be afraid to guide the stakeholders. Make sure they know that categorizing the requirements as "high", "medium", or "low" priority is not as useful as using numeric scale such as 1 through 10. A numeric scale will prevent every requirements being marked as "high". If you have stakeholders who are reluctant to rank or there isn’t consensus among the group, forcing a decision is necessary. Let them choose the requirements they want by assigning votes. For instance if you need to prioritize 30 requirements, hand out 15 votes to each stakeholder, then rank the requirements based on the number of votes each received. Remember, identifying the necessary requirements to delineate your scope is the first step. Second, rank the requirements by urgency to understand the most valuable order of implementation and assure a valuable product. 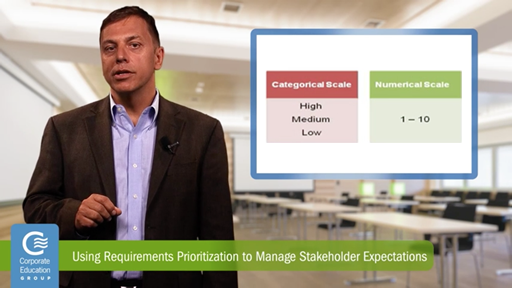 Last, but never least, guide stakeholders through the requirements prioritization process.